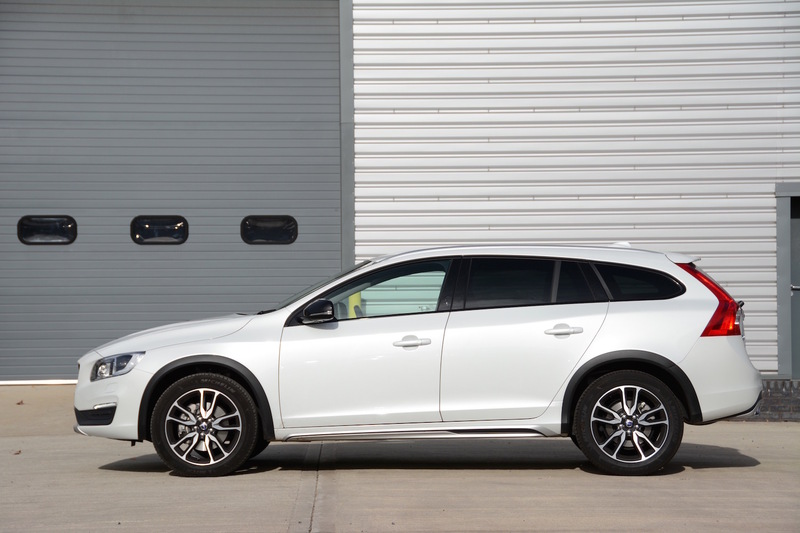 The Volvo V60 Cross Country may look like a 4×4, but it’s not – so you get the benefits of the crossover image together with the fuel-saving efficiency of front-wheel drive. The Volvo V60 Cross Country is trying to emulate the concept of a crossover such as a Subaru Outback, in other words it’s an estate body on top of jacked-up suspension, so it looks like an off-roader, but it’s more aerodynamic than a large 4×4 – and has better handling. However this car is just front-wheel drive, so don’t try taking it up a mountain. 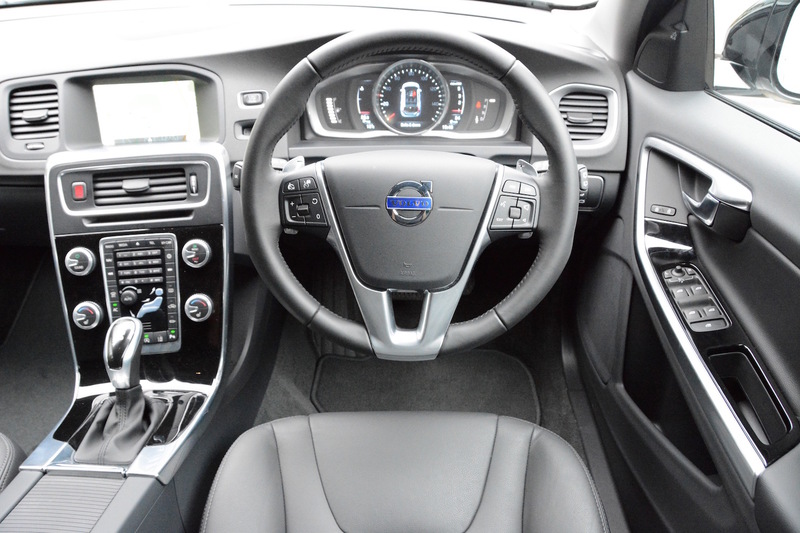 We think the Volvo V60 Cross Country looks good on the outside, and it’s a similar story inside, with a refreshing dashboard design compared to German rivals. 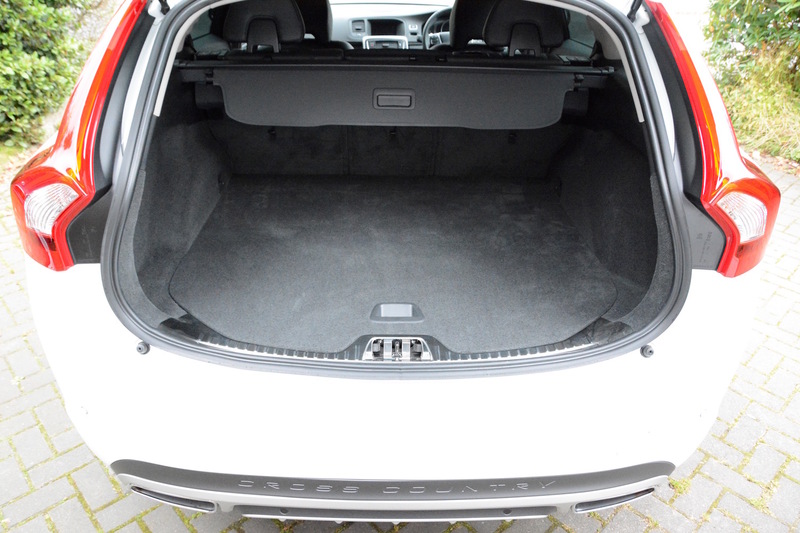 Aside from the increased ride height and some cosmetic changes, underneath this is a Volvo V60 Estate. 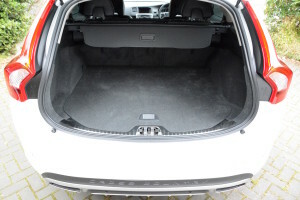 However it’s not as big in the boot department as some Volvo estates of old. Our test car came with a 190hp 4-cylinder, 2-litre turbodiesel engine, automatic transmission, and front-wheel drive. 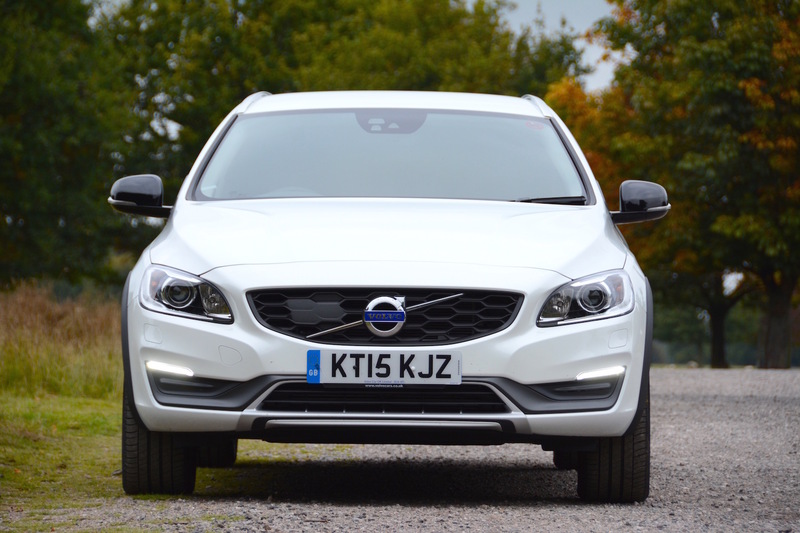 The headline is that the Volvo V60 Cross Country is good to drive overall. The steering, handling and ride are all easy to live with, although the suspension can be somewhat firm over poor surfaces including speed bumps. If you want the handling attributes of rear-wheel drive you’ll have to look to a couple of German rivals. Like other Volvos that we’ve tested recently, it’s generally quiet and refined, and it’s a relaxing car rather than a car that encourages you to drive it quickly. If you do need to make rapid progress, then it responds reasonably well – up to a limit – as it can sound strained under load. The automatic gearbox offers you a choice between D and S, with S being considerably more responsive, but it’s not always in the right gear at all times. There are steering wheel-mounted paddles should you be taken by the desire to change manually. The tyres have no more off-road grip than normal tyres, so don’t be attempting any heroics across muddy fields or if it snows. Our main issue with the car is the infotainment system. There’s a seemingly random collection of buttons scattered around the centre console, controlling items such as media and satnav. As a demonstration of how challenging it can be to find things, the traffic announcement function was switched on when the car arrived, and we never found a way to switch this off during our week with the car – despite seeking advice of other Volvo owners. 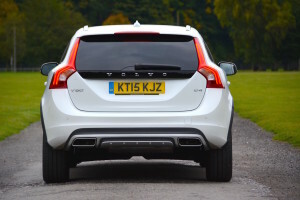 The new XC90 shows that Volvo can develop excellent infomedia systems, we’ll just have to wait until the V60 catches up with the latest technology. The official combined economy figure for the Volvo V60 Cross Country is 67.3mpg, equating to 111g/km CO2 emissions. On paper, this engine does a good job of combining performance and economy, however regular Green Car Guide visitors won’t be surprised to discover that the real-life economy after a week with the car fell short of this figure, at 44.2mpg in mixed driving. We managed 47.1mpg at 70mph on the motorway. 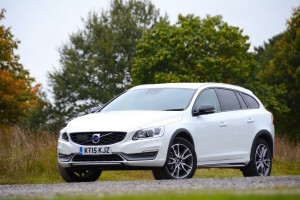 We achieved a real-life average of 49.2mpg from the Volvo V60 D4 Estate (also with the automatic transmission), so the aerodynamics resulting from a higher ride height of the Cross Country model – along with larger wheels and tyres – would seem to have an impact on fuel economy. 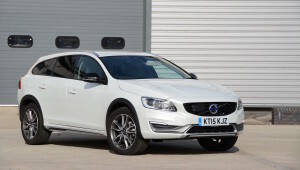 The all-wheel drive version of the V60 has an official combined economy figure of 49.6 mpg, along with 149g/km CO2, so the front-wheel drive V60 Cross Country is substantially more efficient. 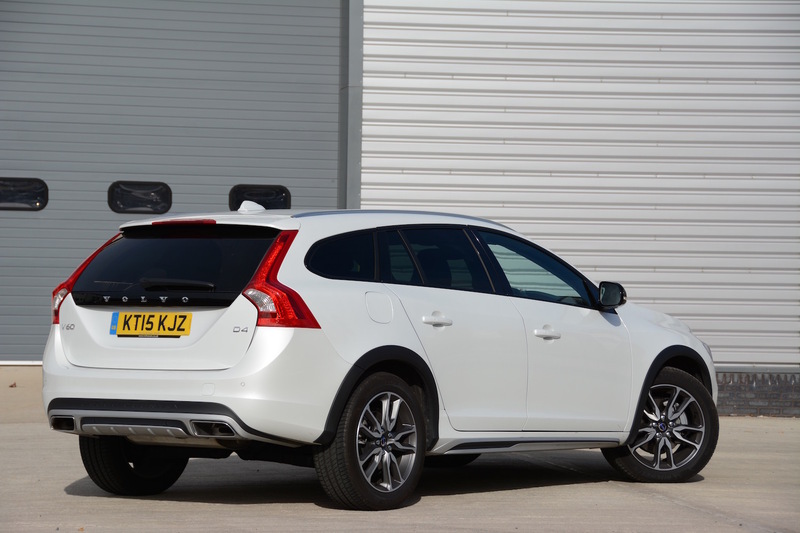 The Volvo V60 Cross Country costs £34,995. Our test car had the options of Driver Support Pack (£1,900); Winter Pack with Active Bending Lights (£375); 8-speed Geartronic Transmission Start/Stop (£1,550); Premium Metallic Paint (£925); Keyless Drive with Personal Car Communicator (£550); Sensus Connect with Premium Sound by Harmon Kardon (£500); Volvo On Call with App (£450); Dark Tinted Windows – Rear Doors and Cargo Area (£350); Piano Black Wood Trim (£225); Gear Shift Paddles (£150); Tempa Spare Wheel and Jack (£150); taking the total price to £42,120. Although the car does have a premium feel, £42,000 is getting somewhat expensive. Basic equipment is also good and Volvo still performs well in the area of safety. The Volvo V60 Cross Country is an easy car to get on with. It looks good, it feels like a quality product, and it offers a relaxing driving experience. It’s a refreshing alternative to German rivals. The standard V60 Estate also looks good, and is equally likeable to drive. So it’s a matter of preference whether you want a regular estate or a crossover appearance, even though there’s no off-road ability under the surface of the Cross Country model. 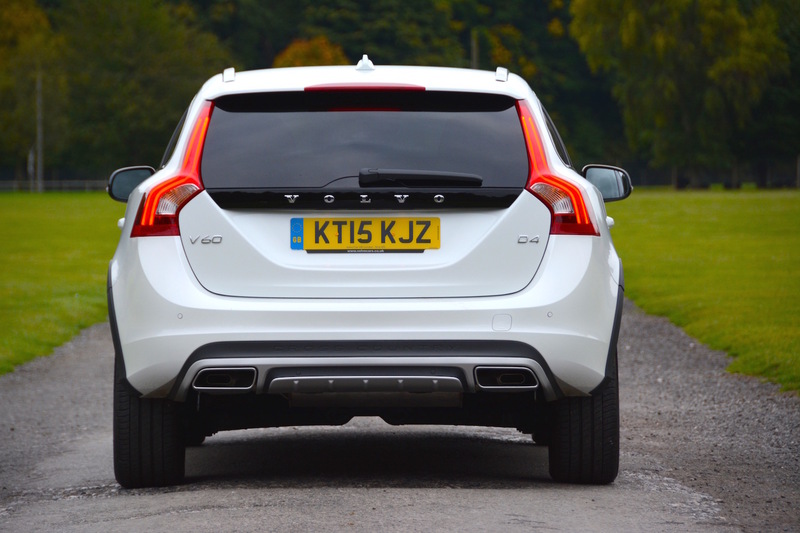 The real-life fuel economy was a little disappointing, and don’t road test a V60 and the new XC90 back-to-back, as you’ll want the infomedia system in the XC90. 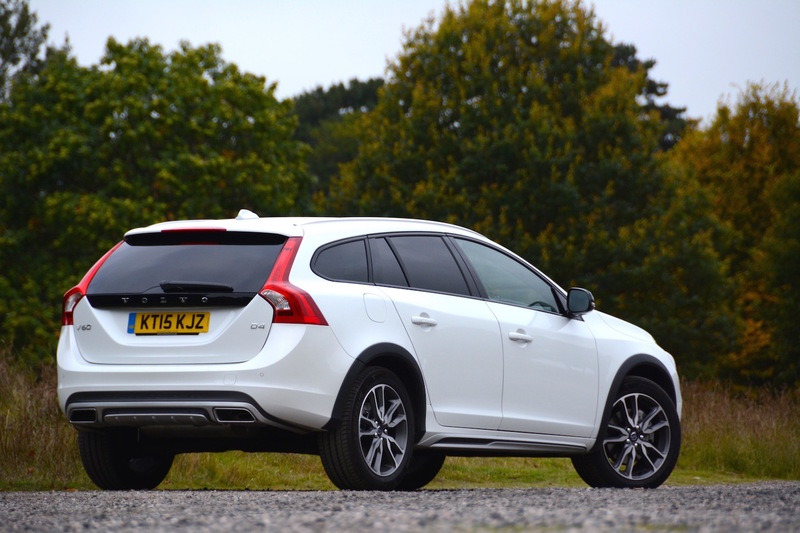 The Volvo V60 Cross Country gains a Green Car Guide rating of 8 out of 10.